7CPC: 7th Central Pay Commission for Central Government Employees: Regarding payment of Allowances to PS Group “B” officers whose grade pay has been up graded from Rs. 4800 to 5400. 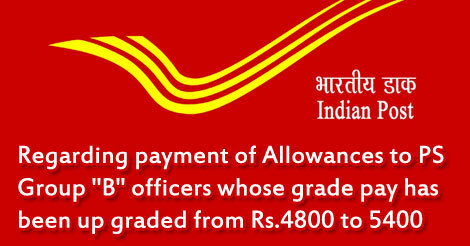 Sub : Regarding payment of Allowances to PS Group "B" officers whose grade pay has been up graded from Rs.4800 to 5400. Attention is invited to G.S.R. 721 (E) and copy of Resolution published under no. 1-2/2016-IC dated 25.7.2016 by Ministry of Finance circulated vide DP Posts OM No. 7-2/216-PCC and Para 4 of Ministry of Finance, Department of Expenditure OM No. 1-5/2016-IC dated 29.07.2016 circulated vide DG Posts No. 7-2/2016-PCC dated 01.08.2016 regarding implementation of recommendation of 7th Central Pay Commission. 2. In this connection various Circles and Associations have sought clarification regarding payment of Transport and other allowances to the officials whose Grade Pay has been upgraded on the implementation of the recommendations of the 7th Central Pay Commission. "regarding admissibility of Transport Allowance and HRA to Superindentdent (Posts) as per up-graded Grade Pay of 5400 (PB-2) from GP 4800 w.e.f. 1.1.2016, consequent upon the up-gradation of post vide this Department notification dated 25.07.2016 of CCS (RP) Rule, 2016. The issue has been examined by this Department. Accordingly, the Department of Posts is advised to reckon and pay the Allowances (other than DA) to Superindentdent (Posts) corresponding to their up-graded Post in re-revised pay structure w.e.f. 1.1.2016 at the existing rate under the terms and conditions prevailing in the pre-revised pay structure till the date of effect of allowances (other than Dearness Allowance) be notified by this Department”. 4. This may be brought to the notice of all concerned for necessary action.